Outdoor lovers looking for a small town would do well to check out Homer, a fishing and resort town of about 4,000 people in Alaska. Famous for its many bald eagles, this town is at the southwestern end of the road from Anchorage. Cruise lines have Homer on their list of destinations. From here you can go the Alaskan Maritime Wildlife Refuge, which encompasses much of this area and the Aleutian Islands to the west. The Homer area offers unparalleled recreational and scenic opportunities as a community for individuals looking for natural beauty and a year round climate that is generally milder than in the rest of Alaska. 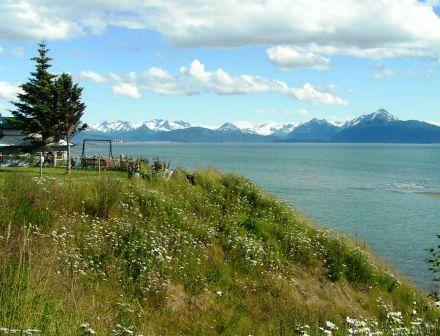 The Spit, a 4.5 mile glacial moraine that juts into Kachemak Bay, is the seasonal center of Homer. It is crowded with docks, restaurants, stores, and charter outfits for fishing and adventuring. Homer is blessed with a number of good restaurants and bakeries including the Cosmic Cafe, 2 Sisters, and Sourdough Express. Most people in Homer live on the slopes of the mountain above town. It is easy to obtain a top-notch view of the Spit, the bay, and the snow-capped mountains and glaciers on the opposite side of Katchemak Bay. There are new condos available at the end of the Spit with prices averaging in the $100's, depending on location and view. The median listing price of a home was $276,000 in early 2019, according to Zillow.com. On the downside Homer does not have a compact, interesting downtown. While there are some interesting stores and restaurants, they are spread out over several streets; it is not possible to walk between them. Locate at the end of a more than 200 mile road from Anchorage, life in Homer can be isolating and small, particularly in winter. Carl Wynn Nature Center. Pratt Museum (natural history). Kenai Peninsula Orchestra performs year round, including summer festival. Pier One theatre offers plays. There is a movie theatre. Homer Council of the Arts hosts frequent programs.. There is dance, music, galleries, and artist studios. Kachemak Bay Campus of Kenai Peninsula College offers cultural events, as does the well supported Homer Public Library. Center for Alaskan Coastal Studies field station in Peterson Bay. Crime is about thirty percent higher than the national average. Anchorage International Airport is 225 miles from town by car, or a short shuttle flight from Homer. Charters and air taxis are an Alaskan way of life; people routinely hire them for sightseeing or outdoor adventures. The ferries of the Alaskan Marine Highway go through Homer.